Reconstruction of Fort Recovery. Courtesy Ohio Historical Society. As he prepared for renewed war with the Indians, Fort Greeneville was not the only fort Wayne constructed that Clark and many other young bloods considered wasted time. Wayne was determined to occupy the site of the country’s’s greatest defeat and send a clear message to the Indians about American determination. Some 23 miles north of Greeneville, he stationed eight companies of men and constructed Fort Recovery on the very site of St. Clair’s Defeat. (The site is in a country area today about halfway between Dayton, Ohio and Fort Wayne, Indiana). The men were given the grim task of burying the scattered bones of their massacred comrades, including over 500 skulls. They also recovered the lost cannons of St. Clair’s army. As spring progressed, the Shawnees, Miamis, and Delawares began assembling for what was shaping up to be another great season of fighting the Americans. Their British advisers urged them to concentrate their attacks on the American supply line, which was long and still shaky in spite of the efforts of officers like Clark. But as it turned out, Fort Recovery was an irresistible target. In June 1794, a large and overconfident Indian force attempted to storm the fort. American losses were high; 22 men were killed and 30 wounded. However, equal losses were inflicted on the Indians,who abandoned the attack. Wayne was exultant, and though he couldn’t have known it for sure, Indian confidence was badly shaken. Little Turtle traveled to Detroit to consult with the British and ask for artillery and British troops to help fight Wayne, whom he described as “the black snake who never sleeps.” Hedging their bets, the British stalled on investing more resources in the Indians’ fight to maintain control of Ohio. 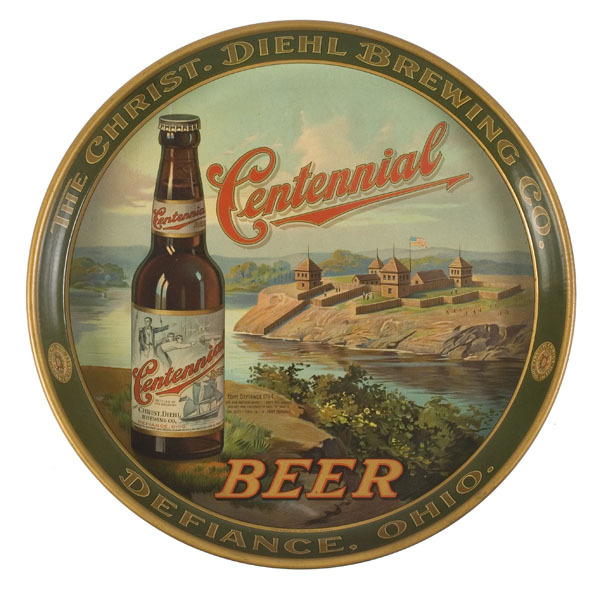 Great beer tray tribute to Anthony Wayne and Fort Defiance. The smaller print reads, "Fort Defiance 1794. Gen. Mad Anthony Wayne -"I Defy The English, Indians, And The Devil In Hell To Take It." Gen. Scott - "They Call It Fort Defiance." The Scheeme was perposed & certain Suckcess insured if attempted – Genl. Wilkinson Suggested the plan to the Comdr in Chief, but it was not his plan, nor perhaps his wish to Embrace so probable a means of Ending the War by compelling them to peace – this was not the first occasion or opportunity, which presented its self to our observant Genl – for some grand stroke of Enterprise, but the Comdr in Chief rejected all & every of his plans. had this Alarm been well founded & the Enemy on our Heels, the old Gentleman, would have been caught asleep for he had already gone to bead to give ease to his infurmities & was so fast in the arms of Morpheus as to give some trouble to wake him understanding the cause of the Bustle. As Wayne moved ever closer to an armed confrontation (if far too slowly for Clark’s taste), Indian leaders debated what to do. Little Turtle, with his military savvy, thought Wayne was different from Americans the coalition had been defeating for years. These Americans blew away like leaves in the fall, he said, but came back bigger and better in the spring. Blue Jacket of the Shawnees remained confident.The battle was on. Present-day site of Anthony Wayne's Fort Deposit. Finally arriving in the vicinity of the British fort on August 18, Wayne had the Legion stop once more to build Fort Deposit as a stronghold before engaging with the Indians. Wayne planned to go into battle with a stripped-down army, not one overloaded with baggage and supplies the way that St. Clair’s had been. All backup supplies would be safeguarded inside the fort. That way, if the battle went badly, the Americans would have a fort to retreat to, regroup, and rearm. Wayne called Deposit his “citadel” of supplies. 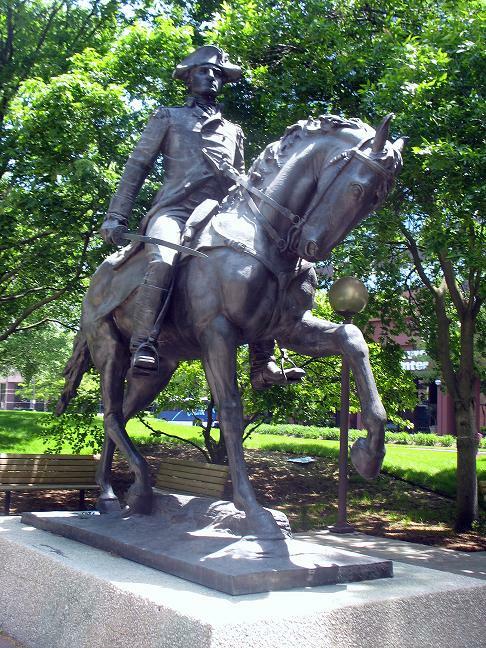 Statue of Anthony Wayne in present-day downtown Fort Wayne, Indiana. Wayne spent the rest of the reason burning all the crops and villages for fifty miles in every direction from his string of forts. 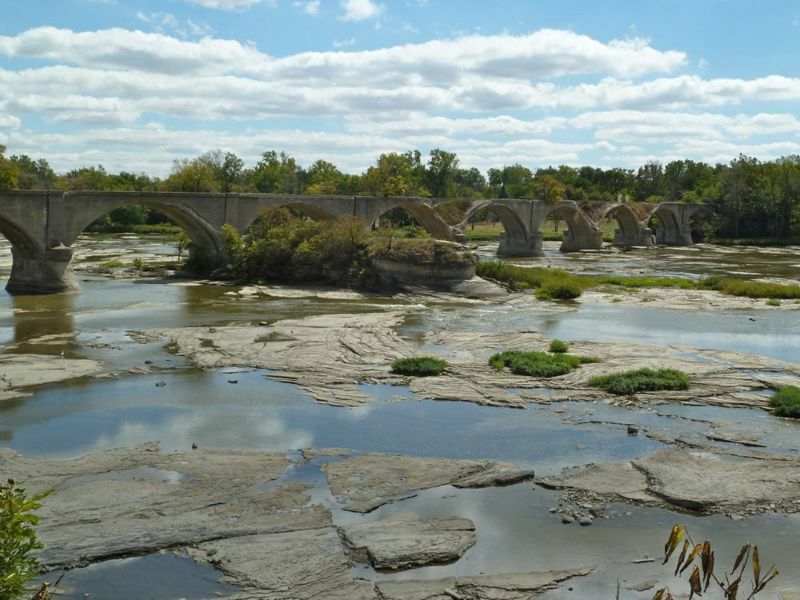 A new fort straddling the portage route that connected Lake Erie and the Wabash river was built in the fall of 1794 and named Fort Wayne (present-day Fort Wayne, Indiana). As for William Clark, he fought bravely at the Battle of Fallen Timbers. Within months it became clear that the Indian wars were over in the Ohio territory; Wayne’s peace would last a generation. And Anthony Wayne was more than fair with Clark, sparing him from disgrace after Clark forgot to set the password when he was officer of the day. At the same time Clark’s infatuation with Wilkinson came to an end. In retrospect one can see the measured, considerate leader of the Corps of Discovery begin to emerge — just in time to meet Meriwether Lewis and begin the friendship that made history.